Seeking a lawful earning is our duty as Muslims and utilizing the energy to strive for such a living is a means of worship and a path to blessed monetary rewards. Muslim youth can take some productive steps to learn about business in Islam, invest in great ideas and generate some profit. This article aims to offer such steps, with practical tips on how to achieve them. Starting out in any business can be very daunting. In the case of youth, your parents may become worried about your financial future. This, in addition to many uncertainties, only serves to increase your limiting beliefs, until you are ready to quit even before you start! When you actually make it to launch period and beyond, you continue to face challenges every day. A productive business is purpose-driven, with goals and outcomes for this world and the hereafter. It is a business that earns you lawful profit, personal fulfillment and adds value to your life as well as that of others. But it is not without its fair share of tests. “O you who have believed, do not consume one another’s wealth unjustly but only [in lawful] business by mutual consent” [Qur’an: Chapter 4, Verse 29]. Creating jobs for others (within an Islamic environment and in accordance with Islamic principles). Although there is no simple success formula for setting up and running a business, you can take productive steps when starting out, and with each step as you progress. With these steps, you can achieve a lot with your business and build a strong connection with Allah. Consider your business an act of worship, so every action is done sincerely for Allah’s sake and according to the shari’ah. Is it purely for Allah’s pleasure? Is it to gain popularity or conform to societal pressures? Pray for divine guidance. Familiarize yourself with this prayer and utilize it for every business decision you are faced with, no matter how small it may seem. Memorize the wording and understand the meaning of the supplication. Consult your trusted others, e.g. mentors and family members, about the options. Put your trust in Allah. Shura is the process of making decisions by consultation and deliberation among those who have an interest in the matter on which a decision is to be taken, or others who can help them to reach such a decision. “And those…whose affair is [determined by] consultation among themselves” [Qur’an: Chapter 42, Verse 38]. Seek the opinion of knowledgeable people, experts and mentors regarding the knowledge required. Note the different ideas and issues brought forth and perspectives given. Make an informed decision based on ideas offered. Study the Islamic principles of running a business and then familiarize yourself with the state laws, as well as specific guidelines of the industry you are going into. Invest in your learning and stay updated on new developments. Ignorance is not an excuse! Register with a library and set up a personal one at home. Subscribe to journals, magazines and expert blogs, such as Islamic investment network. Research and attend reputable business trainings. Whether you have a big or small budget, invest wisely and avoid wastage, debt and interest (riba). The general rule is that all financial arrangements that the contracting parties agree to follow are lawful, as long as they do not include an element of riba. Rather than adopting the concept of interest, Islamic finance is based on ownership of assets and the sharing of risk, found in these two concepts: Musharakah and mudarabah. The two basic categories of financing are: 1) profit-and-loss-sharing (PLS), also called participatory modes, i.e., musharakah and mudarabah and 2) purchase and hire of goods or assets and services on a fixed-return basis, i.e., murabaha, istisna’a, salam and leasing. This is unlike Western finance, which is largely based on principles of interest, debt and risk transfers. Seek ways of securing personal or halal loans rather than riba-based loans. Most Islamic loans are partnerships or joint ventures, but are called loans because they accomplish pretty much the same thing conventional loans do. Explore all buying options and search for good deals before hiring people or making purchases. Work on becoming financially sound and seek expert financial advice when you need it. Fuse your passion and interests with your knowledge and existing skills and abilities. Utilise this in providing value in the form of unique products and services to others. Use a Mind Map to generate ideas. Ask and listen out for what people around you need and conduct surveys. Be on the lookout for different opportunities. Take care of your body, mind and soul. Find time for your spiritual nourishment, physical well-being, social relations as well as emotional fulfillment. Write out your business vision. Make each action intentional and directed towards your vision and goals. Focus on your character and the great value you can provide through your business by aiming for excellence. Follow diligently in the business steps of the trusted one, al-Amin. He was known to be honest by everyone, a fact not even the disbelievers could deny, and had a high moral character. In fact, Lady Khadijah Bint Khuwaylid hired him based on his reputation as an honest and reliable person. His excellent qualities were experienced first-hand by her servant, Maysarah, who accompanied him on the trade journey and later recounted the details to his mistress. Seek ways to add value, more value, and yet more value to your business. Take account of your general character and strive to work on your weaknesses. Read how the Prophet(pbuh) lived his life as a tradesman and Lady Khadijah as a successful business owner. From local events such as coffee mornings, to online groups and masterminds such as those found on Facebook and LinkedIn, you can reach out to Muslims with similar values to share ideas and collaborate in meaningful ways. Search for a business group or create one. Connect with peers, experts, mentors and coaches for advice and support. Nothing will ever go exactly as planned, so do your best and learn from each mistake. Our world, and especially the business world, is never all about positive experiences; rather it has some glittery aspects and many rusty ones. Remember that you are not perfect. Read about business success stories that started out as failures for inspiration and motivation. Beyond spending on basic livelihood, you are obliged to pay zakat if applicable to your level of wealth. It purifies your wealth and gives you the opportunity to empower other Muslims. Just as seeking wealth is important, so is giving from your wealth. Doing so frees you from the greed of simply accumulating money for your worldly desires. Aim to make your business a life-changing one for your target audience. Give charity, discounts, freebies, scholarships and mentoring opportunities. Be humble and thankful for the opportunity to share your knowledge, skills and services. Say a heartfelt ‘Alhamdulillah‘ each day. 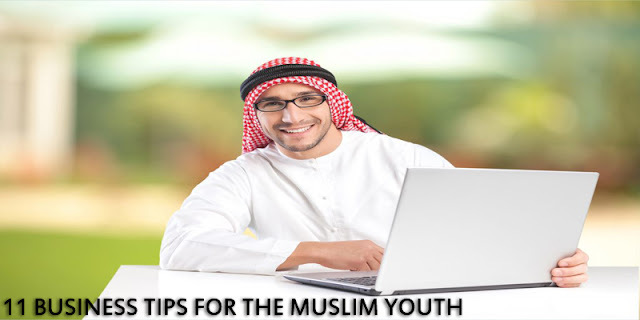 There are many examples of Muslim youth engaging in productive businesses of various kinds, from coaching and consulting to catering and retail. As a young man or woman, having a business is an opportunity to become a better Muslim because you are tested with upholding sincerity in all of your dealings as well as fulfilling the rights of others. The framework of such a business is governed by Islamic law in a similar way that most parts of your life as a Muslim are. So, as much as using your business to earn lawful wealth and enjoy using that wealth is your right, you must also ensure that you seek success in the hereafter through it. After all, everything is a test: your life, your business and your earnings. ”Your wealth and your children are but a trial, and Allah has with Him a great reward” [Qur’an: Chapter 64, Verse 15].